(BBC): Ultra-high resolution images of several Dead Sea Scrolls are now available on the web, after Google helped digitise the ancient texts. The search firm lent its expertise in scanning documents to the Israel Museum in Jerusalem. Both amateur and professional scholars will now have access to 1,200 megapixel images. 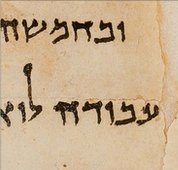 Five scrolls have been captured, including the Temple Scroll and Great Isaiah Scroll. Ardon Bar-Hama, a noted photographer of antiquities, used ultraviolet-protected flash tubes to light the scrolls for 1/4000th of a second. The Dead Sea Scrolls were discovered between 1947 and 1956 inside 11 caves along the shore of the Dead Sea, East of Jerusalem.